1Department of Leukemia, The University of Texas, M.D. Anderson Cancer Center, Houston, Texas, USA. 2Department of Hematopathology, The University of Texas, M.D. Anderson Cancer Center, Houston, Texas, USA. Received: March 2, 2016; Revised: April 11, 2016; Accepted: May 25, 2016; Published online: March 27, 2017. TO THE EDITOR: A 26-year-old man presented with a 3-year history of progressive arthralgia and joint stiffness. One year ago, he was examined by a chiropractor for intermittent generalized joint pain and a maculopapular rash on his chest. He was referred to a physician because his complete blood cell count (CBC) showed a high eosinophil count. After undergoing a standard workup he was diagnosed with rheumatoid arthritis and given low-dose methotrexate, which was switched to leflunomide as his symptoms did not improve. He was referred to our clinic because of eosinophilia. On admission, he complained of fatigue, night sweats, and arthralgia. His physical examination showed unremarkable results except for a few skin nodules on his left leg. His hemoglobin was 13.9 g/dL and white blood cell (WBC) count was 38.2×109/L, with an absolute eosinophil count of 23.3×109/L and a platelet count of 330×109/L. The peripheral blood smear differential count showed 61% eosinophils, 15% lymphocytes, and 22% neutrophils. Serum lactate dehydrogenase (LDH) was 1,130 IU/L (range, 313–618 IU/L) and serum interleukin (IL)-5 levels were high while tryptase and IgE levels were normal. The autoimmune, cardiac, and infectious disease work up showed negative results. A bone marrow (BM) aspiration and biopsy revealed hypercellular BM (80%) with trilineage hematopoiesis and a marked increase in eosinophils (66%) (Fig. 1A, B). Eosinophil morphology was largely unremarkable except for mild uneven granulations. There were no mast cell aggregates or lymphocytosis. Multicolor flow cytometry (MFC) analysis detected a small population of aberrant T cells (0.5% of total cells, 4% of lymphocytes) expressing CD2, CD4, and bright CD5, but a complete lack of surface CD3 expression. This population of T cells also showed significant loss of CD7 expression (Fig. 2). In addition, MFC also detected a small population of aberrant mast cells (0.04%) co-expressing CD117 and CD25 (Fig. 2) but negative for CD2 and CD30. Immunohistochemistry on BM biopsy revealed small T cells with normal expression of CD5 (Fig. 1C). Furthermore, CD117 staining highlighted scattered spindle-shaped mast cells (1–2% of total bone marrow cellular elements) (Fig. 1D) and CD25 staining was negative in these cells. There were focally mild increases in reticulin but not in collagen fibrosis. Cytogenetic analysis showed a normal karyotype. Fluorescent in-situ hybridization (FISH) analyses did not detect PDGFRA (CHIC2), PDGFRB, or FGFR1 gene rearrangements. We could not detect the FIP1L1-PDGFRA gene fusion transcript by molecular methods. The V-γ4 T cells with monoclonal T cell receptor gamma chain gene (TCRG) rearrangement were detected by PCR. Next generation sequencing (NGS)-based analysis of the BM for 28 specific genes commonly mutated in patients with myeloid malignancies detected a variant with uncertain origin on exon 27 of the MLL gene (NM_005933) but no mutation in the KIT gene. Real-time PCR did not detect D816V KIT gene mutation. Overall, these findings were compatible with a diagnosis of lymphocytic variant hypereosinophilic syndrome (LV-HES). The patient is under observation without curative therapies for LV-HES but only treated with leflunomide for rheumatoid arthritis with adequate symptom control. Since the aberrant mast cells did not meet the conventional diagnostic criteria of systemic mastocytosis (the presence of compact BM mast cell infiltrates), we concluded that the patient has LV-HES with a sub-diagnostic systemic mastocytosis as described by Pardanani et al. . Patients with LV-HES commonly present with cutaneous and rheumatologic manifestations. In addition, the presence of monoclonal T cells with an abnormal immunophenotype and increased levels of Th2 cytokines is common in LV-HES patients . Although these patients generally respond to steroids, some patients respond to imatinib even in the absence of FIP1L1-PDGFRA rearrangement . Occasionally, LV-HES may transform into an aggressive T cell lymphoma . To the best of our knowledge, LV-HES with co-existing sub-diagnostic mastocytosis has never been described, although clonal mast cells in HES have previously been reported . It is unclear whether these two processes indicate a coincidental finding or have a pathogenic relationship. It is possible that IL-3 secretion by the Th2 cells in LV-HES patients can promote mast cell activation via STAT3 ; the STAT3 mutation (Y640F) may co-exist in aberrant T cells and mast cells in LV-HES patients . This study was supported in part by the MD Anderson Cancer Center Support Grant CA016672 and Award Number P01 CA049639 from the National Cancer Institute. Morphologic and immunophenotypic features of the bone marrow biopsy and aspirate. (A) Bone marrow core biopsy shows hypercellular bone marrow with trilineage hematopoiesis and markedly increased eosinophils (H&E, ×200). (B) Bone marrow aspirate smear shows increased eosinophils, black arrows (Wright-Giemsa, ×500). (C) Immunohistochemical stain for CD5 shows a few scattered T cells (CD5, ×500). (D) Immunohistochemical stain for CD117 shows slightly increased atypical spindle-shaped mast cells (black arrows) with interstitial distribution (500) representing subdiagnostic mastocytosis. 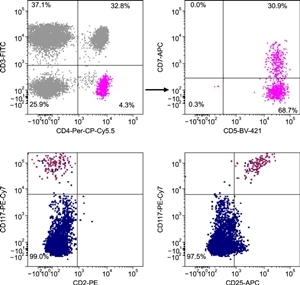 Flow cytometry analysis of bone marrow aspirate detected a minor population of aberrant T cells (about 0.52% of total cells) coexpressing CD4, CD5 with partial loss of CD7 (upper panel) and CD2 expression (not shown), and an aberrant population of cells coexpressing CD25 and CD117 mast cells (0.04%) (lower panel). Pardanani, A, Chen, D, Abdelrahman, RA, et al. Clonal mast cell disease not meeting WHO criteria for diagnosis of mastocytosis: clinicopathologic features and comparison with indolent mastocytosis. Leukemia, 2013;27;2091-2094. Helbig, G, Wieczorkiewicz, A, Dziaczkowska-Suszek, J, Majewski, M, Kyrcz-Krzemien, S. T-cell abnormalities are present at high frequencies in patients with hypereosinophilic syndrome. Haematologica, 2009;94;1236-1241. 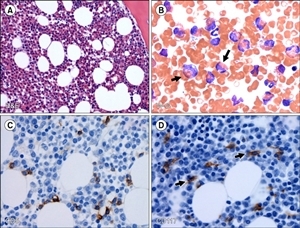 Christoforidou, A, Kotsianidis, I, Margaritis, D, Anastasiadis, A, Douvali, E, Tsatalas, C. Long-term remission of lymphocytic hypereosinophilic syndrome with imatinib mesylate. Am J Hematol, 2012;87;131-132. Roufosse, F. Peripheral T-cell lymphoma developing after diagnosis of lymphocytic variant hypereosinophilic syndrome: misdiagnosed lymphoma or natural disease progression?. Oral Surg Oral Med Oral Pathol Oral Radiol, 2014;118;506-510. Wiednig, M, Beham-Schmid, C, Kranzelbinder, B, Aberer, E. Clonal mast cell proliferation in pruriginous skin in hypereosinophilic syndrome. Dermatology, 2013;227;67-71. Lantz, CS, Boesiger, J, Song, CH, et al. Role for interleukin-3 in mast-cell and basophil development and in immunity to parasites. Nature, 1998;392;90-93. Walker, S, Wang, C, Walradt, T, et al. Identification of a gain-of-function STAT3 mutation (p.Y640F) in lymphocytic variant hypereosinophilic syndrome. Blood, 2016;127;948-951.